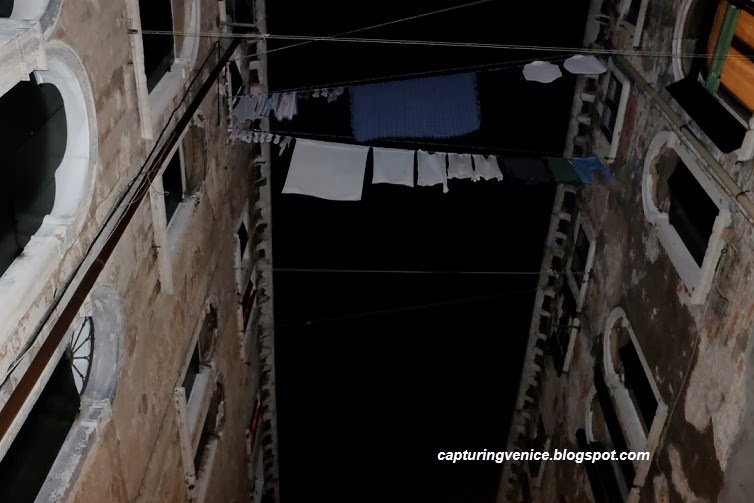 After several months of enjoying my lovely apartment on the Calle dei Cerchieri, I had to find cheaper accommodation. I found a little room in a flat on Calle del Volto just off the Fondamente delle Procuratie near Piazzale Roma. I shared the apartment with an incredibly sweet-hearted, gregarious and generous Venetian flatmate. His landlords in turn lived in the flat below us with their two children. Entering the building, we would walk past our landlords' laundry, playroom and storeroom, and then climb an incredibly steep set of stairs, past their flat on the first floor, to reach our flat on the top level of the building. From our front door, we then climbed another steep flight of steps which ended in a kitchen that was just large enough to fit a stovetop and a small set of shelves. The window sill was the kitchen bench. I swapped a view of the campanile of San Pantalon for a view into the apartments across the alleyway and my new street ended at a bridge leading to a local prison (at the former Santa Maria Maggiore complex) instead of the Grand Canal. As you can see, the building is made up of two blocks (containing 60 apartments in total) joined by a pedimented roof and an arch. The blocks span from Fondamente delle Procuratie across to the Fondamente dei Cereri. At either end of the blocks are larger apartments that look like the façade of a typical Venetian ‘palazzo’ with balconies and large windows. A long courtyard provides light and ventilation (and front door access) to the smaller flats within the block. Living inside the flat, I could easily have mistaken the modular apartment construction for a modern building, but in fact the building dates from the late 16th century, when the Procurators of San Marco had multi-family housing built for the needy (hence the name of the street – Fondamente delle Procuratie). When I moved into the flat, there was a wardrobe literally stacked with blankets. As winter deepened, I gradually added blanket after blanket to my bed, so that by the time Carnevale rolled around, I would be burrowing under at least ten layers of blankets every night. It was so damp that the walls would drip green during the winter, and come summer, we had to whitewash the internal walls. Apart from the intense damp and cold, my abiding memory of living there is of countless platefuls of fresh tiramisu which my kind hearted flatmate would whip up most evenings. He’d start making the tiramisu late at night, so in the early hours of the morning, he'd be urgently knocking on my bedroom door to let me know that the tiramisu was ready, and that he had to get to the laundry pulley (outside my bedroom window) to relay a plateful of tiramisu to our neighbor across the alleyway. Here is a view of the complex on Google maps - you can just make out the arches at either end of the blocks. The yellow building to the right of the map on Fondamente Cereri is where the poet Diego Valeri lived (click here for more about Diego Valeri). The complex on top left hand corner of the map is the prison. 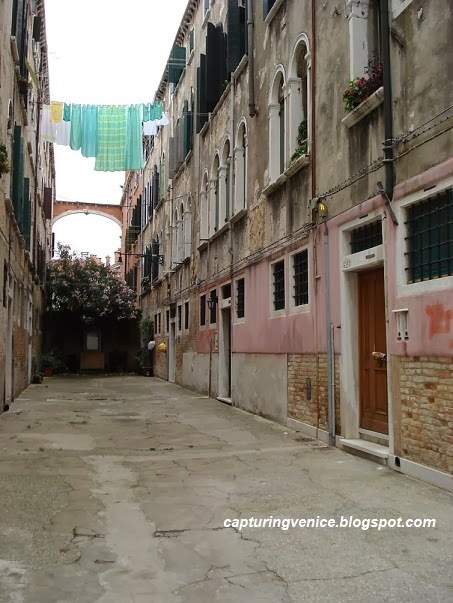 If you want to read more about this place, Dorsoduro 2410-30 (Fondamenta Cereri and Fondamente delle Procuratie) is described on page 67 of Egle Renata Trincata's A Guide to Venetian Domestic Architecture. Oh, totally cool! I had an idea to take photos of each place in the Egle Trincato booklet (Castello and Dorsoduro), but ran out of steam when I found how difficult it is to get good photos in many of the narrow streets. It didn't matter, because the chase was exciting! Oh, that's a great idea! 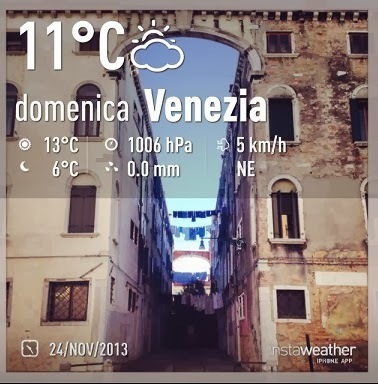 I bet you're cold in Venice right now! Hello again, Yvonne. It's nice to think of you along the Fondamente delle Procuratie!